Born into a family of crime fighters, Dinah Laurel Lance follows in their footsteps, assuming the costume and identity of her mother, the original Black Canary. 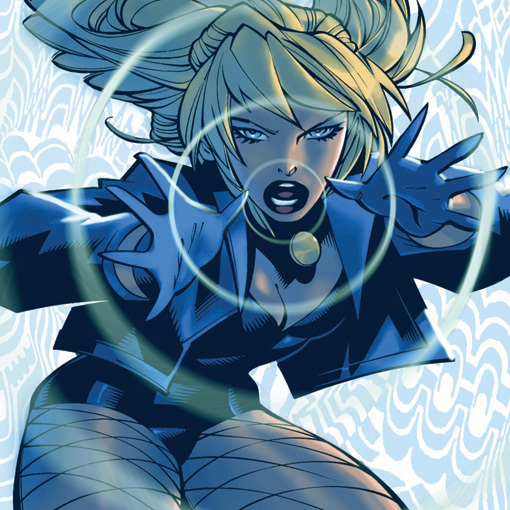 The current Black Canary, Dinah Laurel Lance is the daughter of the former Black Canary and member of the Justice Society of America, Dinah Drake Lance and private eye Larry Lance. As a child, Dinah was inspired to be a crime-fighting heroine just like her mother and the other former JSA members whom she loved like aunts and uncles. Growing up, she developed the "Canary Cry" and with the help of numerous mentors, including the former JSA member Wildcat, she developed her fighting skills. Today, she is one of the world's most skilled fighters and a prominent member on her small team of crime-fighters, The Birds of Prey. Starting with this three-issue miniseries, Dinah moved to Seattle with Green Arrow to start a new life, opening her own florist shop “Sherwood Florist”. Her move to Seattle, though, began a slow spiral downward in her life. Dinah had decided to join an operation to bust a drug ring, but failed. They kidnapped Dinah and proceeded to torturing her, causing her to lose her fertility and Canary Cry. Eventually Green Arrow would save her but Dinah would not be the same after this. From then on, she started to attend extensive counseling, and was able to recover psychologically from the events. However, Dinah’s relationship with Ollie would take a turn for the worst. With years of trust issues having accumulated from being abandoned and walked out on several times by him and having learned of his fathering a son with Shado (albeit unwillingly) and taking money from her business, she finally broke off their relationship after she walked in on him kissing her young florist shop assistant. She came pretty close to hitting rock bottom after learning of Green Arrows death from Connor Hawke who turned out to be yet another one of Oliver’s offspring. Although her life seemed to be spiraling out of control she continued to fight for justice. During Dinah’s downward spiral, Oracle (aka: Barbara Gordon) would ask Black Canary to work as an agent for her, and they would form the Birds Of Prey. When she began working with the Birds of Prey, she decided to get rid of the blond wig and bleach her hair blond. At first Dinah did not get along with Oracle, but eventually the two put their disagreements aside and became best friends, learning that they had so much in common. Later it was revealed during one of the early Birds of Prey issues that Dinah had been married to a man named Craig Windrow when she was very young, but divorced him soon after. Her ex-husband made an appearance in a Birds of Prey storyline where he was seeking her help but in fact, wanted her to return to him after he had stolen money from the mob. When Dinah began dating a European man who later turned out to be Ra's al Ghul, she was seriously injured and the only way to save her was to dip her into the Lazarus Pit. The Lazarus Pit would restore her meta-human ability in the “Canary Cry” and her fertility.